To ensure your data are not exceeded storage limit, there are a number of functions available in SKYVVA, including Delete Message, Delete Basket Histories, Delete Logs, Delete Log File, Log Levels to Delete, Delete Attachments of Bulk Data set in the Bulk Control Board, and Delete Basket and Attachment. However, these functionalities needs, However, these functionalities needs to be configured and activated to perform the cleanup operation. This documentation is written to guide you how to use each functionality. Note: We provide a central scheduler called ‘DoMaintenance’ which locates among others in Scheduler tab. It provide all the functionalities to keep the data storage clean. You have to activate and run this scheduler otherwise no data cleaning activities is carried out. The scheduler ‘DoMaintenance’ is a global scheduler. It exist only 1 in skyvva and process all integrations. This is the same like Checker. You can see this because in the column ‘Integration or Interface Group or Interface’ there is empty. 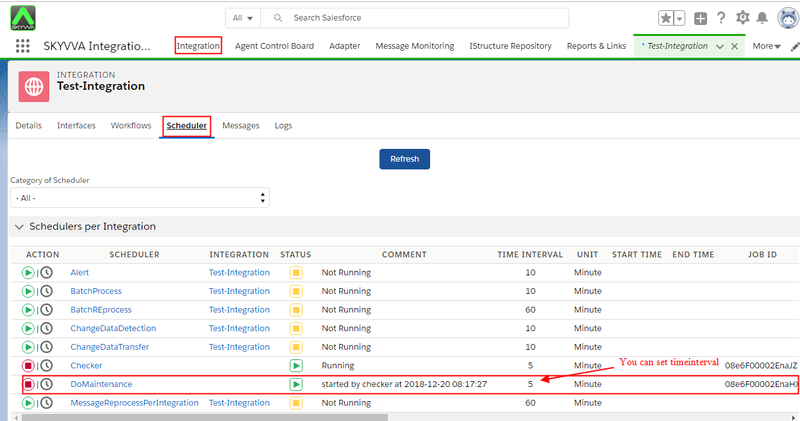 Enter Integration page and Message Setup section. Checkbox on Delete Message to enable the performance. 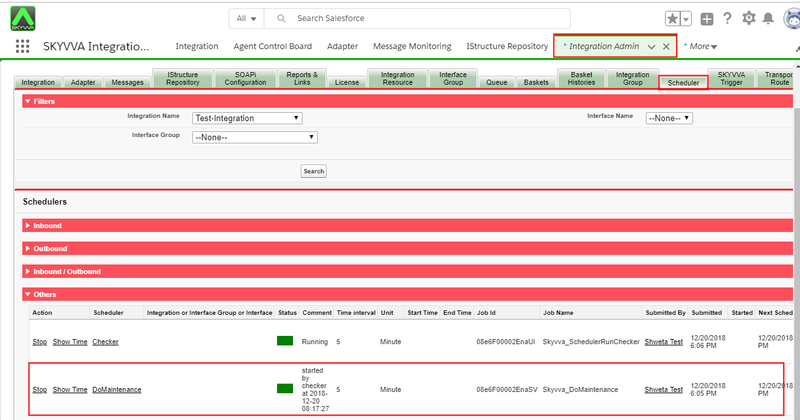 – We have a Separate tab ‘Scheduler’ in the integration detail page. This function is no different from above function since they attempt to delete messages. However, this functionality will delete the other status which are Pending and Fail. You can delete as your desire as long as you make the chosen for specific status. Note: If you want to find the Scheduler (DoMaintenance) please kindly look at the content 1. This functionality, indeed will keep the messages accordingly to your determination. The messages will keep until the day you want them to delete. You can put any value number in here. Actually there are two Number of Days to Keep Messages which located in Integration level and Interface level. However, Interface is the first priority. It dominates over Integration level. Whenever the scheduler (DoMaintenace)run it will automatically check on Interface first. So the messages will delete according to the value you put on Interface level. The value number that you put in Number of Days to Keep Messages is determine the time you want your messages to be deleted. So If you leave the empty value, it means that you want to delete the messages immediately. Likewise, if you put 0 value, the messages will be deleted immediately too. When it comes to basket deletion, Delete Basket Histories appears to mind. The configuration isn’t hard to follow at all. The Maintenance scheduler will perform History Deletion of an Integration. Furthermore, you can click on “Delete” or “Delete All” buttons in Batch Control Board clear all baskets. Note: If you want to find the Scheduler (DoMaintenance) please kindly look at the content 2.1. There are three sections of Bulk Data which contains “Delete” button. These buttons are created to delete bulk attachment that store in Bulk Control Board. However, Maintenance scheduler isn’t correlate with this function. If you want to perform the deletion for Attachment, just click on “Delete” or “Delete All” buttons. – Delete log base on the level user selected, error, warning, and info.